Soan Papdi sweet is one of the famous sweets in India. Soan papdi (also known as patisa, son papri, sohan papdi or shonpapri) is a popular North Indian dessert which is a main dish in all functions in India. Indian sweet Soan Papdi is widely recognized by many number of people through out India and had given it a top place in terms of taste. Surdhenu is a leading manufacturer of Soan Papdi sweet in India which has production of 25 tonnes of Soan Papdi sweet every day and 3000 tonnes per annum. 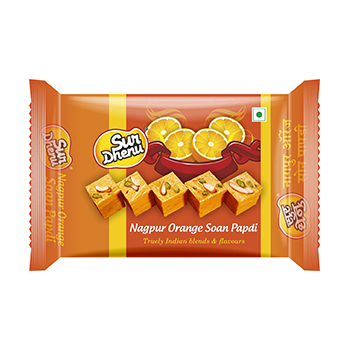 We are exporting Soan Papdi sweet to many countries like Mumbai, Nagpur, Delhi and also foreign countries. Made with utmost professionals in the field of Soan Papdi, Surdhenu Soan Papdi beats all the varieties in taste. India is very famous for many kind of sweets and Soan papdi sweet will stand first in all of them. Surdhenu has a great history in making this sweet. Employing state of the art technology Surdhenu is producing high quality, ready-to-eat snacks, savories & Sweets. From the stage of choosing raw materials to make Soan Papdi Sweet and in the process of making the end product, we follow the international norms for Quality and Hygiene. We believe healthy body and healthy mind are primary requisites for a nation’s development and we are making efforts to maintain our Indians more healthy and active. Be it any season or any occasion,nothing adds to celebration like Surdhenu’s Soan Papdi Sweets. Made from the finest Indian recipes of the past,our wide range of Soan Papdi varieties are relished and admired by people across the nation.We also add lot of exotic ingredients and innovative procedures to the recipes to suit new tastes and create truly distinct and remarkable food items which have earned us a special place in the hearts of everyone. We prepare 5 varieties of Soan Papdi sweets namely Elaichi Soan Papdi, Chocolate Soan Papdi, Elaichi Soan Roll, Orange Soan Papdi and Pure ghee Soan Papdi. When compared with other Soan Papdi varieties Surdhenu’s Soan Papdi will stand first in taste and price. Soan Roll is the new advent by Surdhenu where we changed the shape from cubes into rolls. This will help you in eating easily and you can fit more Soan Rolls into your mouth. Chocolate Soan Papdi and Orange Soan Papdi are the new varieties in the Soan Papdi world and they are more tastier and also healthier. Spices have great place in protecting one’s health. So we have picked Elaichi which is used in many house holds and made Soan Papdi with that. This has the unique taste and people are loving like any thing. Pure Ghee Soan Papdi is the new inclusion in our Soan Papdi range and we have added Ghee to it to get more tasty and also healthy.